Bioderma Cicabio SPF50+ Soothing Repairing Care 30 ml order online. 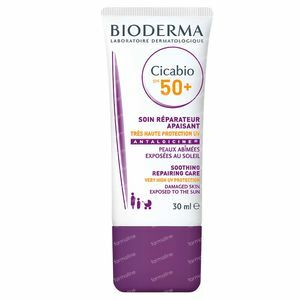 The Bioderma Cicabio SPF50+ Soothing Repairing Care is a 2 in 1 treatment that repairs and protects damaged skin against the sun to limit scarring. While the skin is repairing itself biologically it's extra fragile and in need of protection from scarring and hyperpigmentation. This protection cream has a broad spectrum UVA and UVB filter system that negates sundamage while the antibacterial and skin repairing complex support the regeneration process. A sunprotection SPF50 treatment cream that speeds up the healthy repair of damaged skin and minimizes scarring/pigmentation formation. Gently cleanse the skin and apply the Bioderma Cicabio SPF50+ Soothing Repairing Care onto the affected area. Keep using this cream until the skin is fully repaired. If the skin is exposed to sunlight, reapply the cream every 2 hours at least yet do avoid the eye area. Do not apply this crema to wounds or burns caused by excessive exposure to the sun.